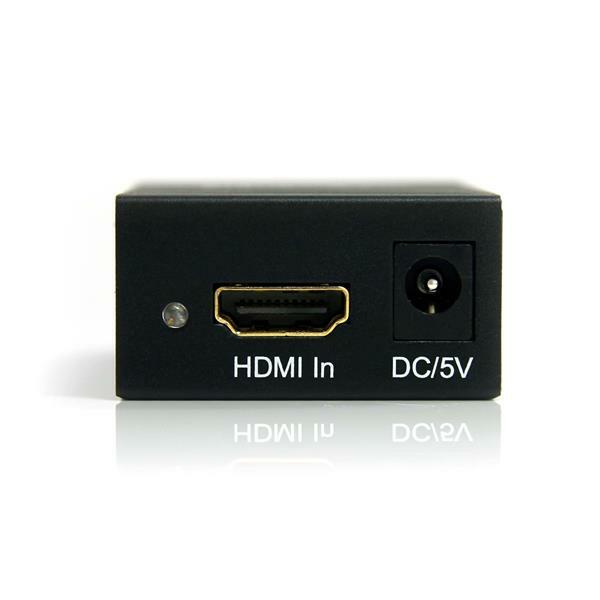 The HDMI2DP DVI or HDMI® to DisplayPort® Converter converts an HDMI, DVI or Mini DVI input signal into a DisplayPort (or Mini DisplayPort) output, eliminating the cost of upgrading your source device hardware or purchasing a new display. 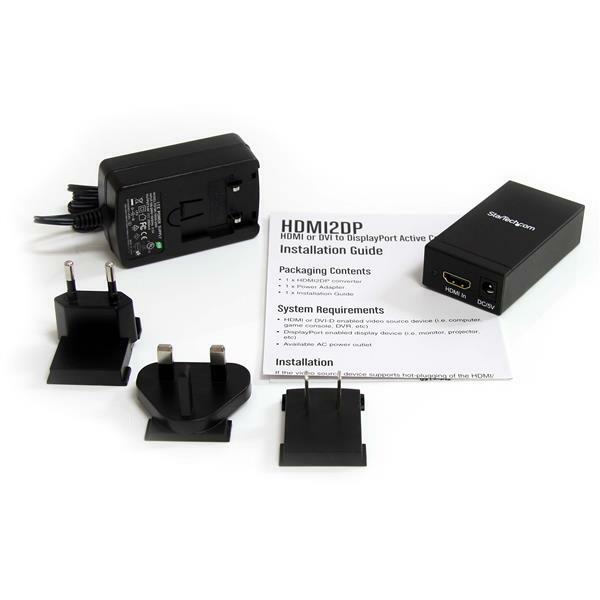 The HDMI2DP is backed by a 2-year StarTech.com warranty and free lifetime technical support. I have been using this adaptor with my critique tablet for less than a year. It has now stopped working and I dont know how to have the warranty honored. We're sorry to hear HDMI2DP stopped working for you. We recommend contacting our Technical Advisors at 1-800-265-1844 or www.startech.com/chat for troubleshooting and, if needed, a replacement unit under HDMI2DP's 2-year warranty. 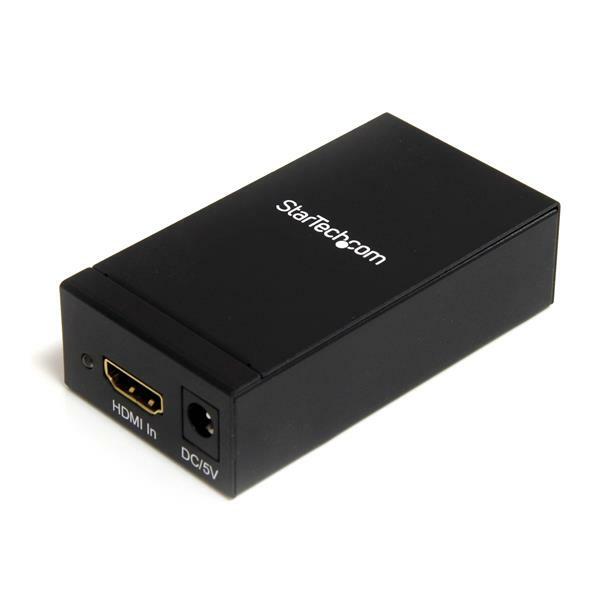 I am not exceedingly tech savvy so I was pleased when I received the HDMI2DP HDMI to DisplayPort Active Converter at no cost to sample and test for this review. I opened the box to a cord with a power source attached, 3 adapter ports/prong types and the ‘power house’ brick. It is important to note that the box does not come with HDMI or Displayport cable. I selected the US adapter port and slid it into the power source. There is a small push button to release the adapter port. Unlike some “release” buttons, this one did not require breaking a nail to dig in, and it was easy to switch out the prong types as needed. Next I plugged the power source into the wall and the reciprocating DC/5V point on the ‘power house’ (as I have dubbed it). The power house has 2 LED lights, one on each side which advises if the particular connections on that side of the device are connected. Following this I plugged in my HDMI cord on the labeled side and my Displayport Cable to the other side. Done! 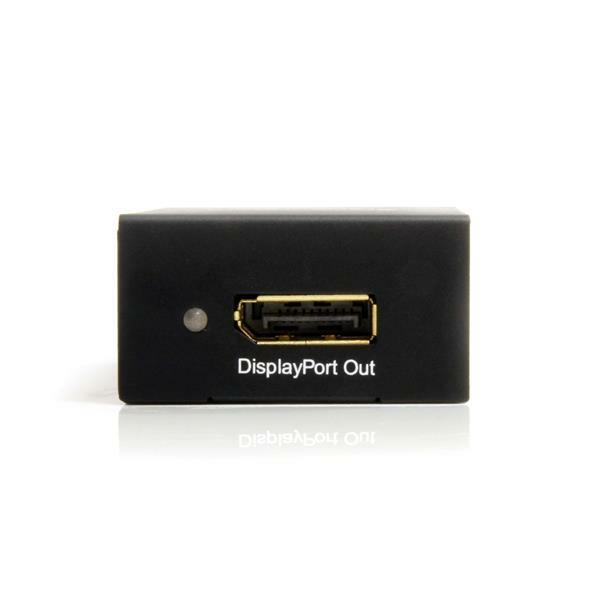 DisplayPort output via HDMI. It worked across various resolutions (all at 60Hz): 1024x768, 1280x720p and 1920x1080p. I do want to point out that the ‘power house’ does get hot. To put this in perspective, my computer ‘power house’ on the cord gets medium warm, but it’s not hot. This centralized box does get pretty hot; however this is not unexpected since it is small and when you consider all the electricity running through it. However, unlike a computer charger which is plastic, the StarTech unit is a metal box. I am not sure if this design was to reduce the heat, but I would have thought plastic (since it is not a conductor) would reduce the heat output. Since the video output sometimes blacks out I`ve occasionally had to cycle the power when it`s been on for a couple of days. My brother in-law says it is because the device is a “passive converter”. Simply put- this device is uncomplicated and a snap to use. No drivers to be installed making it straightforward. The image is accurate and the sound quality is effective which, when all combined is precisely what is necessary! *The person who wrote this review received a free sample for providing an open and honest review of the product. I purchased this item in September 2013. I needed to connect an HDMI computer output to a Data Port input on my projector. The converter works but runs really hot and stops working after a few hours. I have to disconnect the power and reconnect it to get it to work again. This is a real pain because the projector is mounted on the ceiling. Thanks again for letting us know. What you originally experienced with the HDMI2DP would definitely be frustrating. Based on our discussion with you, we determined the HDMI2DP was located too close to another heat source (the projector), but moving the unit to an area with better ventilation fixed the problem. If you run into any more issues, feel free to contact us again at 1-800-265-1844 or through e-mail at support@startech.com.